Home › migrate › Are our phones robbing us of solitude? Are our phones robbing us of solitude? Profound thought while walking across the street on a beautiful, sunny afternoon in San Francisco, checking my email on my iPhone: Are we ever really alone anymore? Taking long walks alone is something that I cherished in my pre-cell phone days, and something I lauded in Quirkyalone as a source of creative inspiration. Long walks alone are when we allow thoughts to form, to see where thoughts lead us. 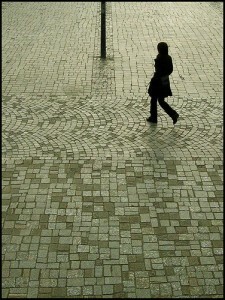 Before I even uttered “quirkyalone,” I had the image of a woman walking alone, a mix of pride, melancholy, and contentment. Now my walks alone are punctuated by my thumb punching “check email” on my phone, when suddenly, though no one is physically present, they may as well be. Mobile technology can be so seductive and addictive, the ability to constantly check messages and feel the presence of the world swarming around us in a million little missives. But at the end of the day, we don’t feel nearly as much alone. And I think in many ways that can also harm our ability to be together. Granted, there are, gasp, people who don’t own cell phones. But we are going mobile, where everything will be checkable. In this era of “ambient knowledge” (everything my 362 Facebook friends “know” about me that I don’t remember sharing) and camera phones (where every moment is sharable), cutting the cord from the Internets–and being alone–takes ever more willpower. Of course, I am the one who hits “check email” directly after a movie, when I could be luxuriating in the closing music over the credits. There’s no question that I’m addicted to the “new,” to the sense that someone cares enough to reach out and touch me, whether through email, text, voice, tagged note! When I spoke at last year’s Conference on World Affairs at Colorado University, Boulder, on the topic “Too Busy to Fall in Love”–we spoke about many ways in which we distract and busy ourselves, making it hard not only to fall in love, but to fall in love with the world: with flowers, passing babies, urban architecture. Multitasking really is the death of love, in a sense, because it kills our ability to pay attention. At the end of the panel, a young woman stood up in the audience she thought technology was making her too distracted to be in love with herself. She limited her email and computer use to a few hours a week. Being online all the time had sapped her energy and detracted from her ability to be radiantly herself. Being agitated and alone feels lonely. Feeling content and alone feels like solitude. There’s a contradiction, of sorts, suggesting that readers of an online community get away from their computers to feel more alone, and therefore, more open to community. But I do think there’s something about the ability to spend radiant time alone, self-satisfied (in the best sense), that allows us also to be present to others (be they friends, a relative, a client, or a partner). If we are better able to be still with ourselves, we’re able to be fully present for others. We’re not so distracted. We can listen. I’m curious. . . has anyone else found technology making it difficult to feel solitude. With the omnipresence of technology, do you ever really feel alone anymore, or more alone? Is alone-ness something to strive for? When I lived alone in Brazil, I discovered the joy of doing only one thing at a time. For example, if I was standing at the window smoking a cigarillo, I would completely dismiss any thoughts like,”what am I going to do next” or “it was nice at the beach today”, and focus on the slow burning of the tobacco and the curls of smoke drifting over the city. While our culture encourages technological intrusion, it is so rewarding to politely decline. Very easy solution: turn the damn thing off for awhile and stop complaining. Or use the junky free phone your junky carrier gave you when you signed up 5 years ago. You know the one with the shoulder strap and rotary dial? Nobody can ever get a hold of me. Problem solved.